A special announcement from Deer Valley Resort in Park City, Utah. DEER VALLEY RESORT; PARK CITY, UTAH (September 25, 2018) – Available for 2018-2019 winter season bookings, One Empire Pass is Deer Valley Resort Lodging and Reservations newest, luxury vacation property. Situated in the stunning Empire Pass area of Deer Valley Resort, One Empire Pass is an intimate ski-in/ski-out community of 27 private residences that boasts expansive views up to the Daly Chutes and Lady Morgan Bowl, as well as down valley to Historic Park City Main Street and beyond. One Empire Pass embodies all the warmth and comfort of casual mountain design, while showcasing the latest modern luxury features and finishes. With two, three, and four-bedroom residences ranging from 2,025 to 4,350 square feet, One Empire Pass features open, spacious kitchens with living and dining areas that flow freely, broad window walls and “see through” balconies and private elevators servicing each residence. Social living areas that are nicely separated from relaxing and sleeping spaces and tranquil outdoor living spaces complete the residences. One Empire Pass Lodge provides two levels of family recreational and social amenities, such as après-ski and continental breakfasts during ski season, a game room with a visual simulator sports game, classic arcades and Pop-a-Shot basketball, and a 24/7 spectacular coffee and cocoa machine the makes 50+ custom drinks. A kids’ room includes Xbox, Netflix kid movies, an art station and a puppet theatre. The lodge also features over-sized, infinity-edged spa pools and fire pits; a fitness center; a 5-star valet ski service provided by JANS Mountain Outfitters that include ski rentals and clothing for last-minute needs; on-site guest ski storage; a resident manager providing concierge services; complimentary underground heated parking, and the Empire Pass Shuttle service to handle all transportation needs with ease. For pictures of the new One Empire Pass Lodge, please visit https://deervalley.widencollective.com/c/fzvucxul or contact resort Sr. Communications Manager Emily Summers at 800-424-DEER (3337), 435-645-6522 or view the resort's website. To follow resort happenings on social media, search #deervalleymoment. 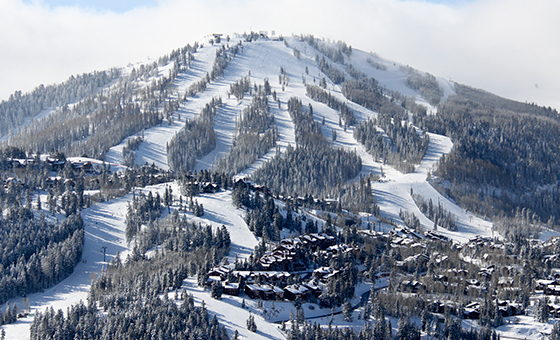 Deer Valley Resort located in Park City, Utah, revolutionized the ski industry by providing the first-class service one would receive at a five-star hotel. The ski-only resort offers 21 chairlifts, 103 ski runs, six bowls, 300 annual inches of powder, 2,026 acres of alpine skiing, limited lift ticket sales, 14 restaurants, three elegant day lodges, hundreds of luxury accommodations and a renowned Ski School and Children’s Center. Deer Valley is honored to be ranked as the #1 ski resort in North America by the readers of SKI Magazine for 2018 and the United States’ Best Ski Resort by the World Ski Awards for a fifth consecutive year (2013-2017). This message is intended for emily@deervalley.com. You have received this email because you have selected to receive notices about special offers and other related information from Deer Valley Resort. To ensure future delivery of emails, please add deerfriends@deervalley.com to your safe sender list or address book. © Deer Valley Resort. All Rights Reserved.